The Cardiovascular Symposium scheduled for Saturday, February 16 in the lobby of the New Peebles Hospital will be facilitated by nine local and regional medical specialists. Cardiothoracic Surgeon, Dr. Rodger Miller, in a BVI Health Services Authority (BVIHSA) report explained that the specialists will update the medical community on the latest cardiovascular management strategies. He said the meeting will also feature topics including the impact of cardiovascular disease and how primary health care can mitigate this; surgical management of cardiovascular disease in renal failure patients; cardiovascular disease and male sexual dysfunction and when to call it quits; and the ethical dilemma in the management of cardiovascular disease. Presenters include, Howard Spencer, Mahendra Carpen, and Drs. Alaire Khan-Frazer, Belinda Morrison-Blidgen, Chrisel Bovell-Chichester, Heskith Vanterpool, Joel Stevens, Joseph Blidgen and Rodger Miller. Dr. Miller further added that participants can expect a very informative and exciting symposium. “We will also have a cardiovascular skill station which will give the participants a chance to have hands-on experience in terms of the diagnosis and management of some of these cardiovascular diseases. We are also going to have cadaveric hearts, real life pig hearts at the conference so we can have on the spot dissections,” he said. The aim of the symposium is to bring awareness to the public as to how cardiovascular disease will affect their health, mitigating factors that they can implement in order to effectively improve their health and prevent them from getting the disease. Dr. Miller said his hope is that after the patient and health care professionals are updated on the protocols and world leading strategies that are available, then they can implement them in patients’ day to day practice. 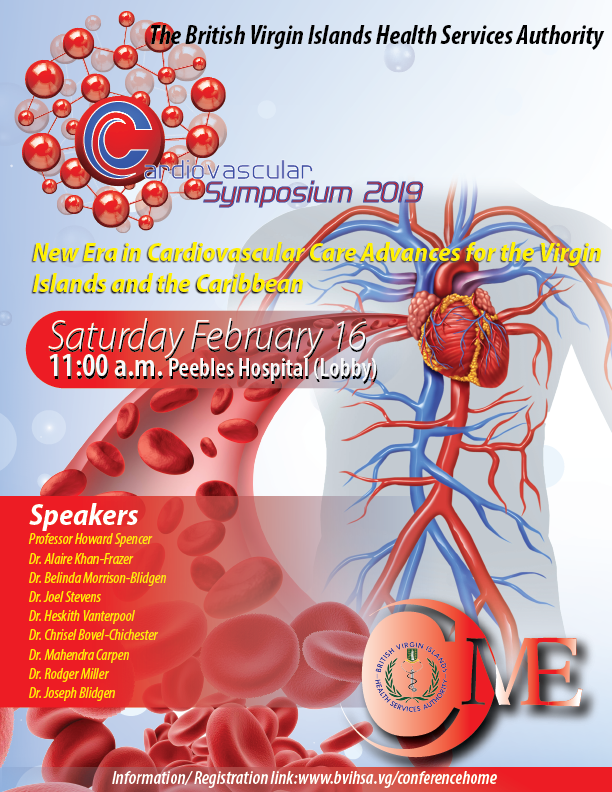 The public can hear more from Dr. Rodger Miller about the Cardiovascular Symposium by tuning in to the BVIHSA Report on ZBVI on February 11 at 9:00 a.m. Persons are also encouraged to follow the Authority on Facebook at facebook.com/bvihsa or view our website at www.bvihsa.vg for more information about the symposium and related activities. The symposium will be held at 11:00 a.m. All medical participants will be awarded seven continuing medical education hours.